Pressure could also be coming from short orders, which market intelligence platform CoinFi says are at all-time high. The world's second largest cryptocurrency fell 8 percent to a low of $170.34, bringing its drop since the high in January to roughly 90 percent, according to CoinDesk. Ether typically rises and falls alongside its larger, better-known predecessor bitcoin. But that trend is changing. Despite volatility, bitcoin's value in 30 days has risen by 0.1 percent. Ether meanwhile has fallen 45 percent in the same time period. "In this case, bitcoin is acting like more of a safe haven for cryptocurrencies — it's kind of consolidating," said Mati Greenspan, senior market analyst at cryptocurrency brokerage eToro. 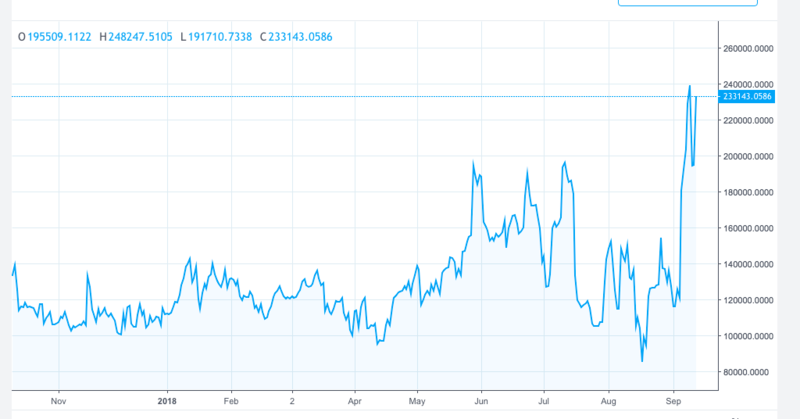 Ether's recent performance marks a sharp reverse from last year. Retail investors were excited about its utility compared to bitcoin, which can't be used to build blockchain applications and is mostly seen as a speculative investment or a store of value. The cryptocurrency rose more than 9,000 percent after starting the year around $8. "There isn't an opportunity for yet another 1,000-times growth in anything in the space anymore," Vitalik told Bloomberg News interview this Saturday in Hong Kong. "The blockchain space is getting to the point where there's a ceiling in sight." Ether is the name of the cryptocurrency, but it's closely associated with the popular Ethereum blockchain. Unlike bitcoin, which gives access to a global financial network, ether gives users access to a computer network. Its use has been compared to gasoline for a car. Developers can use ether tokens as fuel for certain functions on that blockchain. "The fact that Vitalik is less bullish could be causing some to sell and it stands to reason that most of his most devout followers will be holding Ether," eToro's Greenspan said. Not insignificant bets, either. Tam said they're watching "multi-million dollar bets" in real time. "Retail investors were completely euphoric a few months ago. Now, that emotion has flipped and they're panicking," said Tam, who is also a former Goldman Sachs analyst. "Shorts are going to ride that wave. Analysts also say investor enthusiasm is eroding because of scrutiny in initial coin offerings that built on Ethereum's platform. The Securities and Exchange Commission said earlier this year that ethereum itself is not a security. But the agency's chairman has said initial coin offerings, many of which were built on the Ethereum blockchain platform, are indeed securities subject to SEC law. On Tuesday, a federal judge in New York refused to dismiss a case that argued two cryptocurrencies were not securities for the purpose of criminal law. The Brooklyn, New York district judge said a reasonable jury should be able to apply what's known as the Howey Test, which is applied to securities. While CoinFi's Tam sees regulation as a positive for the long haul, and the only way to usher in a "healthier market," investors seem to disagree. "Others see this as cause for panic — an end to the lax rules and low hanging fruit to which they've become accustomed," Tam said. "You also now have a ruling on the table that effectively means ICOs are now subject to securities law."